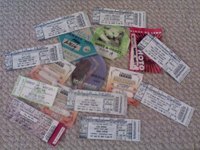 This past summer, my Billboard/LG Mobile Beat summer, was a blur of 19 concerts, 19 photoriffic blogs posts, a plethora of surreal experiences that made me want to invest in diapers (my hips are too wide), and very, very little sleep. I entered the competition on a whim. Who knew that it would turn into something so big? After all those shows last summer, when I got the call telling me that I was the winner, earning a trip to the 2008 Grammys right here in my hood in Los Angeles, I wished that I had invested in those diapers. A lot of this is still setting in, but it's really here - GRAMMY weekend - my reward for being an OCD blogger of the best/worst kind. Through the magic of modern mobile technology, I will be blogging live from the event. I will be giving the readers of Billboard.com a personal glimpse into the Grammys. I'll be there for both blogging and photography, so please check back for some very exclusive photos and commentary that are coming straight from this fanboy's mouth that I promise will be embarassing and awesome at the same time. Not that I wasn't worried for awhile there. Threatened by the much publicized WGA strike, I checked the news everyday, figuring that I was fortune's fool. Was my trip to the granddaddy of music award shows going to be cancelled? Would the hype surrounding the event merely culminate in a dusty FedEx box with a "Hey, sorry. xoxo, Billboard" note, a puffy-paint Grammy sweatshirt, and a generic picture of my favorite singer, celebrity crush, and personality in music, Carrie Underwood, whose first album Some Hearts has just been certified 7x platinum, marking the biggest debut in Country music history for a solo artist, waving at me with a pasted-on word bubble that read "OmG, sry?" In the end, fate smiled upon my over-gelled mohawk and the Grammys said, "Somehow, someway, we gotta make it up out the hood someday" (what up, Jay-Z, you know, because I know you reading this... because we is homeys... in my dreams, where I am tall enough to go on all the rides at California Adventure). The Grammys were on and I realized, "It's Game time, homey I'm living proof, like Snoop Dogg c-walking on top of the Devil's roof" (what up to you as well, The Game). That same moment, I realized that it makes also no sense for a guy who listens to the soundtrack to "Wicked" on his way to work (it's Gah-linda) to quote so many hip-hop lyrics in his everyday life. But sometimes, life doesn't make sense. In essence, "Game time" officially starts this Sunday at the Grammys, though I feel like it's been on since last summer, in what has been one of the longest, but most fly overtimes in the history of live event blogging (I know, I know, I am being forceddddd to look at celebrities and listen to music all day long, boo hoo). Needless to say, I can't wait. What am I looking forward to? A whole lot. Two of my favorite artists, Josh Groban and Carrie Underwood, both of whom I saw this past summer, will be taking the Grammy stage to perform. Groban will be doing a duet with Andrea Bocelli, while I'm hoping Carrie performs her newest single "All-American Girl," which would be my "wrestling music," if I was in the WWE (and I just want to see Brunette Carrie or Astro Carrie if you're familiar with the music video, which is reminiscent of dreams that I have on a bi-weekly basis). I was excited to hear that Beyonce' will be performing with the legendary Tina Turner, but part of me would be ok with hearing/singing Beyonce's "LISTEN!!! I AM ALONE AT A CROSSROADS!!! I'M NOT AT HOME IN MY OWN HOME!! AND I'VE TRIED AND TRIED *humming because I forgot the words*...BUT YOU SHOULD HAVE KNOWWWWWWN!! OH!!!!" from the Dreamgirls soundtrack. Though I'm realizing that as I stood up, mouthed the words, and started throwing my hands all over the place just by typing that just now, it's probably for the better that she doesn't sing that song. In terms of presenters, my all-time favorite artist Stevie Wonder will be in the building, which is a thrill above all else. If he drops a couple bars of any of his classics that kept me sane during high school and college, it will go down as the greatest night of my life. While a lot of people think I'm joking (but people who really know me know I'm serious), I can't pretend that it's not a big deal that Miley Cyrus, THE Hannah Montana, will be a presenter as well, along with previous castmember of The OC, loveydoveyloveydoveykisskisskisskiss Chris Brown, who has to be one of the more certified fresh personalities in music today (and he's touched Autumn Reeser, which instantly makes me want to touch him. Yeah, I said it). Huge thank yous have to go out to my bosses at work for dealing with my sleep-deprived grumpiness all summer after long nights of concert-going and blogging, the bands in Los Angeles that gave me unprecedented access after my unsolicited solitations, the Carriefans, Claymates, and Grobanites that spread the word and gave my blogs SO MUCH LOVE, and my friends that were cheering me on, setting me as their homepage, and being ok with me being asleep for full days on weekends as I prepared for yet another week of blogging. Thank you all, way too many times over. It was a very long beginning, but there could be no better way for it to end. Luckily, this ride doesn't have a height limit. However, it has a dress code, does anyone have a black tie I can borrow? See you guys all weekend! the grammys! i'm glad the writer's strike didn't kill it. i will be checking your blog constantly!